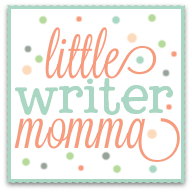 Little Writer Momma: Doing Things "Again"
"There is a saying about life: you don't get a second chance. Your child is here to tell you otherwise. You get a lot of second chances. You get a lot of third chances. You get many fourth chances to do things that you never wanted to do even once. You will do many things again, so many times again: knocking down the same old blocks, pushing the same old swing, reading the same old story, singing the same old song, winding the same old wind-up to its predictable ending. Predictable to you, that is, same old, same old you. Children learn by repetition. And by their repetition we can learn too. We can learn how cynical we are, how busy and easily bored, how impatient and restless. Those are the things we can see in ourselves many times a day. It can take far longer-- a lifetime-- for us to realize what they, with their brilliantly open minds, still see quite plainly: nothing, absolutely nothing repeats. Every moment is all together new. They do things again and again because they haven't calculated the probabilities; they haven't yet anticipated the ending. They are still doing what we have ceased to do: see the infinite possibilities. they are not yet cutting life short by their jaded cleverness. "Been there, done that," we say, as we dispose of our unrealized potential. This is how life comes to us: over and over again, so we can refresh ourselves into open-mindedness, so we can practice being alive. Another chance to let go, another chance to let it be, another chance to see how it goes this time. How sweet that our children keep bonking us awake with such tiny, white-bread offenses. Here it comes again: another start of another day. What a reprieve! You have incalculable chances to change the ending. To change your attitude. To be the new you. Whether you know it or not, you already are the new you. Forget what you think, lose the forgone conclusion, and just be new." Wow. If that doesn't put things into perspective....right?! 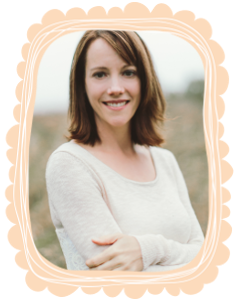 A beautifully stated bit of encouragement for all of us moms who may not want to do something again but must, and will for our children. I'm looking forward to doing some of these things again with a refreshed attitude and willingness to embrace the moment. If you're reading, drop us a note...what are some of the things you do again and again?! 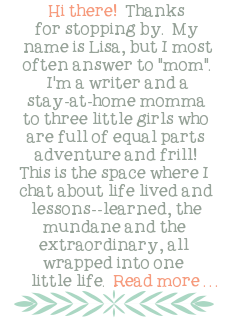 I loved this Lisa! I even sorta quoted it to a friend last weekend! What a picture of God we have in the repetition of our daily tasks with our children... that every morning His mercies are new... that every day is a NEW day, we can have a better attitude, we can walk as He wants us to walk, we can start again!